There’s no doubt that you are very well aware of the importance of practicing proper dental hygiene for yourself. Flossing, brushing, and trips to the dentist are all vital for maintaining your own oral hygiene. If you don’t maintain your oral health, it’s pretty much guaranteed that you are going to experience tooth decay, and perhaps even gingivitis and tooth loss. It’s also pretty safe to say that your breath is going to suffer, too. But did you know that dental health is just as important for your dog as it is for you? Just like humans, canines can develop serious dental health issues if their teeth are not properly cared for. They can develop cavities and gum disease, and they can also end up losing their teeth; you’re probably going to run and hide whenever your furry friend attempts to lick you, too. While dental health is so important for dogs, they need help in this department. They can’t very well brush their teeth on a regular basis, so it’s up to their pet parents to attend to their oral hygiene needs. 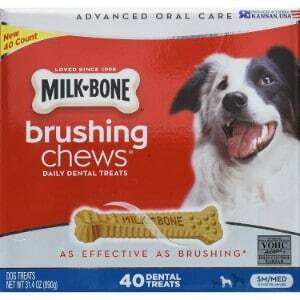 In fact, vets recommended regular brushings using high quality toothbrushes for dogs and toothpaste for dogs. But trying to brush your pup’s teeth on a daily basis can be pretty tough. And, what happens if your pooch just can’t stand having his teeth brushed and runs and hides in his dog bed or dog crate whenever he catches sight of his toothbrush? Even if your furry friend doesn’t like the idea of having his teeth brushed, that doesn’t mean that his dental hygiene should suffer. There are so many ways that you can make sure your pet’s pearly whites are strong and healthy in between brushes and visits to the vet. Feeding him high quality dog food that features dry kibble and offering him crunchy dog treat or two on a daily basis are two ways that you can ensure that his teeth are in tip-top condition. Dry dog food and treats help to brush off plague and tartar buildup. There’s another tool that you can use to keep your pet’s pearly whites healthy: a dental chew. What exactly is a dental chew? How can it help improve your pet’s oral health? What are the best dental chews for dogs on the market? In this review, we’ll cover all of these questions; however, first, we’d like to share with you our top picks for the best dental chews for dogs. What are Dental Chews for Dogs? Now that you have had a look at our top five dental treats for dogs, let’s take a closer look at each option. Below, we offer a more detailed overview of each of these dental dog chews, including what they are made of, what we like about them, and what pet parents who have used these products have to say. After you read through the reviews and decide which one of these dental dog treats is the best option for your furry friend, click on the buttons to find the best prices currently available on Chewy and Amazon. 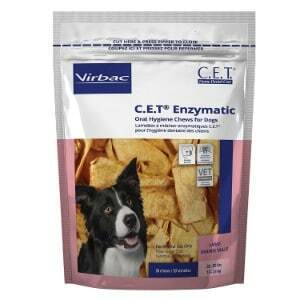 To start out our list of the best dental chews for dogs is the Vibac CET Enzymatic Oral Hygiene Chews. With 75 percent protein content, these chews contain the highest protein level of all the dental chews mentioned on our list, so if your dog requires more protein in his diet, offering him these chews, along with a high protein dog food will help to ensure that he is getting the nutrition that he needs. Protein, as you likely already know, is a vital nutrient for dogs, as it is the building block of healthy muscles and joints. This is important for all dogs, but particularly for canines that are prone to joint issues, such as Great Danes, Doberman Pinchers, and German Shepherds. To further enhance the nutritional value of these chews, they are also infused with probiotics, which helps to promote better digestive health. The Virbac CET Enzymatic Oral Hygiene Chews aren’t just good for your pup’s overall health; they’re also great for his dental health. That’s because they combine natural antiseptic activity with abrasive action that helps to reduce plaque buildup. In fact, they have been tested and clinically proven to control plague. The dual-enzyme system also helps to eliminate bacteria that can thrive in your canine’s mouth and contribute to the development of plaque. Made of high-quality beef hide, these chews offer a great taste that your pooch will love. These dental chews are vet-recommended, and based on the reviews that we read, they are also highly recommended by pet parents. Because of the high protein content, these chews should not be offered to canines that suffer from kidney disease and other health issues that protein could aggravate. Some customers said that the package they packages they received came with less than the 30 pieces that were advertised. Final Verdict: If you want to ensure that your furry pup’s teeth are healthy and strong while also strengthening his muscles, joints, and digestive system, Virbac CET Enzymatic Oral Hygiene Chews are a great option to consider. These chews are vet-recommended and clinically proven to reduce plaque buildup. 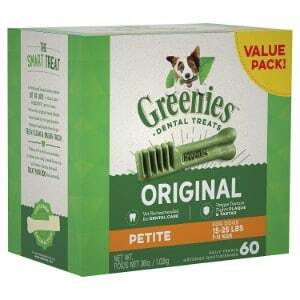 For small dogs, like Pomeranians, Shih Tzus, cavalier King Charles Spaniels, and Miniature Schnauzers, Greenies Original Dental Dog Treats petite size will help to improve canine dental health. What really sets these dental chews apart is that the unique texture that they feature, which helps to remove tartar and plaque buildup right down to the gum line; something that most other dental chews can’t do. They are also proven to freshen breath, so if your pup is suffering from a case of halitosis, these chews will make those slobbery kisses more enjoyable. Made with all natural, easily digestible ingredients, these dental treats for dogs are nutritionally complete and won’t upset your pup’s tummy. The blend of micronutrients and macronutrients, like calcium and phosphorus, that these chews are fortified with will not only help to enhance your pet’s dental health, but will help to strengthen his overall health, too. The texture is chewy, rather than stiff (like a lot of other chews) so your furry friend will find them more enticing. Furthermore, there’s also less of a chance that these chews will damage his gums (some dental chews irritate the gums and cause bleeding). Greenies are vet-recommended and accepted by the Veterinary Oral Health Council, so you can have peace of mind knowing that you are offering your furry family member a wholesome treat. They would make a great Christmas present for dogs, or you can offer them as a treat any time of the year! Final Verdict: Greenies Original Dental Dog Treats are one of the most recommended dental chews for dogs. They’re vet-recommended and accepted by the Veterinary Oral Health Council, so you know that they are high quality. Furthermore, they’re nutritionally complete and will support your pet’s oral and overall health. 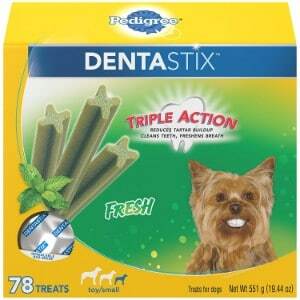 Next up on our list of the best dental chews for dogs is Pedigree Dentastix Dental Treats. Pedigree dog food is one of the most reputable dog food options on the market, so it’s no wonder why their Dentastix are also highly rated. The triple action of these dental chews helps to freshen breath and clean teeth, thereby strengthening your furry friend’s oral health. The patented X-shape design and texture has been clinically tested and proven to reduce plaque and tartar buildup. They can also help to remove particles of food that get lodged into the gum line or stuck between the teeth, further improving your pup’s dental health. Infused with green tea extract and turmeric, these dental chews offer both antioxidant and anti-inflammatory properties, which are extremely beneficial for dogs. However, there has been some concern about the high calorie content, which can be problematic for canines that are prone to weight gain or are overweight; but, if offered in combination with dog food for weight loss and regular activity, your pup shouldn’t have any problem. Pedigree Dentastix come in two sizes: toy/small, which are ideal for dogs that weight between 5 and 20 pounds, and large, which are suitable for dogs that weigh 30 pounds or more. According to the reviews that we read on Amazon, the majority pet parents (and their dogs’) are very happy with these dental chews. Final Verdict: With Pedigree Dentastix Dental Treats, you’ll be able to strengthen the overall health of your canine companion, freshen his breath, and even support his overall health. 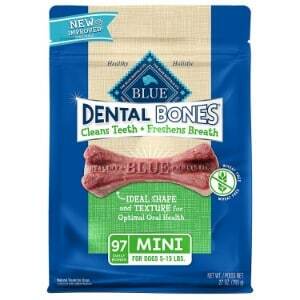 These dental chews are highly recommended by veterinarians and pet parents alike. Of all the dental chews for dogs featured in our review, Milk Bone Brushing Chews most closely resemble a dog treat. So, if your pup is finicky and refused other types of dental sticks, there’s a good chance that he’ll have no problem with these, as he’ll think that you’re offering him a standard treat. They have a high moisture content, which adds their chewy goodness and will also help to keep your pooch hydrated. Milk Bone Brushing Chews look like a traditional dog bone, but they feature little nubs and ridges, which act like a toothbrush. It’s these nubs and ridges that help to remove plaque buildup and control tartar. They can also remove stubborn food particles that may be stuck in between your pet’s teeth. Featuring a yummy flavor that dogs love and made with proteins and fats, these chews will also nourish your furry friend’s overall health. These chews are also enriched with a total of 12 essential vitamins and minerals, as well as calcium, manganese, iron, zinc, and copper. Made in the USA and accepted by the Veterinary Oral Health Council, you can have confidence knowing that you are offering your pet high quality treats. Final Verdict: Milk Bone Brushing Chews are among the most highly recommended dental chews by both veterinarians and pet parents. Accepted by the Veterinary Oral Health Council, made with high quality ingredients, and fortified with essential vitamins, minerals, and nutrients, you can be sure that you will be offering your pet a healthy treat. Last, but definitely not least, on our list of the best dental chews for dog is a product that comes from the makers of Blue Buffalo dog food. Blue Buffalo is one of the most highly regarded dog food manufacturers, as they use the highest quality ingredients and offer a variety of nutritionally balanced recipes for dogs of all shapes, sizes, life stages, and dietary needs, including dry dog food and wet dog food. These dental chews are specially formulate to remove plague and tartar buildup, freshen breath, and improve overall canine dental health. Made of natural ingredients that have been scientifically proven to offer health benefits, these chews will also help to improve your pet’s overall health. For example, glucosamine and chondroitin will help to strengthen your furry friend’s joints, taurine will improve the health of his heart, and vitamins A, C, and E will support the health of his immune system. Completely free of corn, wheat, and soy, these chews are grain free. They’re also free of byproduct meals, so you can have confidence knowing that your pup will be receiving the healthiest chews possible. Final Verdict: For a high quality dental chew that is proven to improve canine dental health, Blue Buffalo Blue Dental Bones Natural Dog Chews are a great option to consider. They are recommended by vets, and most pet parents are very pleased with these dog teeth cleaning treats. There are so many products on the market. The majority of pet parents know that many of these products are essential for the overall health and well being of their furry family members, like a dog collar, a dog harness, and a dog bowl; however, there are some products made for canines that many pet parents don’t realize they should be offering their pooches, like dental chews. What are dental chews? Why should you consider giving them to your pup? In this section of our review, we’ll answer these questions and more so that you can ensure you are providing your furry family member with the very best of care. Dental chews, as the name suggests, are treats that are specifically made to improve canine dental health. They offer a harder, chewier texture than traditional treats, so they take longer to chew. The best brands also feature specialized designs, like nubs and ridges, which help to remove plaque and tartar buildup as your pet chews on them. They can also remove food debris that has become lodged in between your dog’s teeth. Improved oral health. It’s been proven that when dogs actively chew, plaque and tartar buildup is reduced. Since dental chews promote chewing and feature specialized designs, they can effectively help to improve oral health. In fact, the best dental treats for dogs can minimize plaque buildup by as much as 70 percent. In other words, offering your pet dental chews will help to strengthen his teeth and gums. Fresher breath. Canines often suffer from breath issues. This is usually the result of the buildup of bacteria in the mouth. If your pup’s breath has gotten really unruly, that’s a sign that he needs dental care. Dental treats for dogs can help to reduce the bacteria in your furry friend’s mouth, which will significantly improve his breath. Improve overall health. The best dental chews for dogs can also help to improve your pet’s overall health. They’re made of premium quality ingredients and infused with essential vitamins, minerals, and nutrients. When offered in combination with a high quality pet food, providing your dog with dental chews on a regular basis can further enhance his overall health and well being. Dental treats. These chews are much like other types of dog treats; however, they are specially formulated with substances that are proven to improve oral health by killing off bacteria that can contribute to the plaque and tartar formation that can lead to periodontal disease (yes, canines can suffer from periodontal disease). Bully sticks. Bully sticks for dogs are another type of dental chew that can improve your pet’s oral health. These treats are usually made of natural animal protein that has been dried out, such as steer. They are hard, which encourages chewing action that helps to reduce plaque and tartar buildup; plus, dogs love the taste. No matter which type you choose, dog dental chews are an excellent addition to your dog’s diet. They will improve your pet’s dental health and his overall health; plus, they’ll make him happy, too. Given all of the benefits that dental dog treats can offer, they are definitely a worthwhile investment. By including any of the best dog dental chews featured in this review in your four-legged friend’s diet, you can help to improve his oral hygiene, keep him happy and healthy, and enjoy those slobbery kisses that he loves to cover you with even more.